Located on an urban infill lot in Austin, Texas, the Main Stay House was built to withstand hot Texas summers without the need for air conditioning. 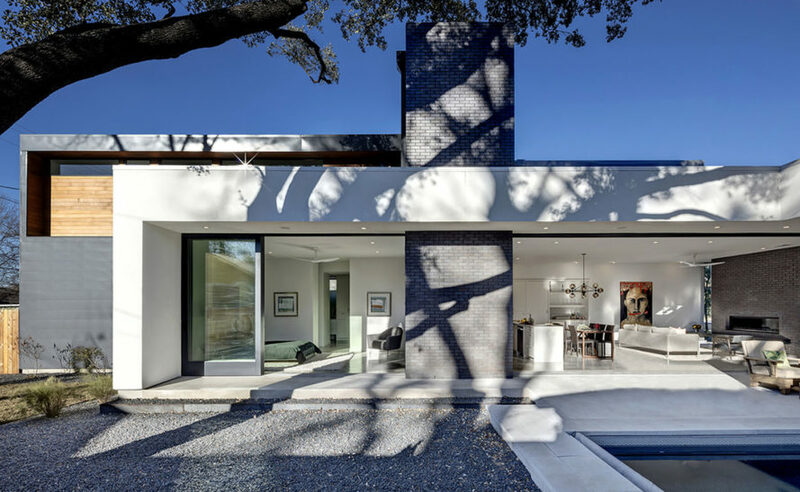 Matt Fajkus Architecture designed the house as an affordable, open-plan residence that provides plenty of space for entertaining and maintains the residents' privacy from the street. And all of this didn't cost an arm and a leg - the home was built for an impressive $250 per square foot. As anyone who has spent time in Texas during the summer knows, air conditioning can be your best friend. But MF Architecture wanted to create a home that didn’t need all that energy-sucking AC, but could still keep dwellers cool. 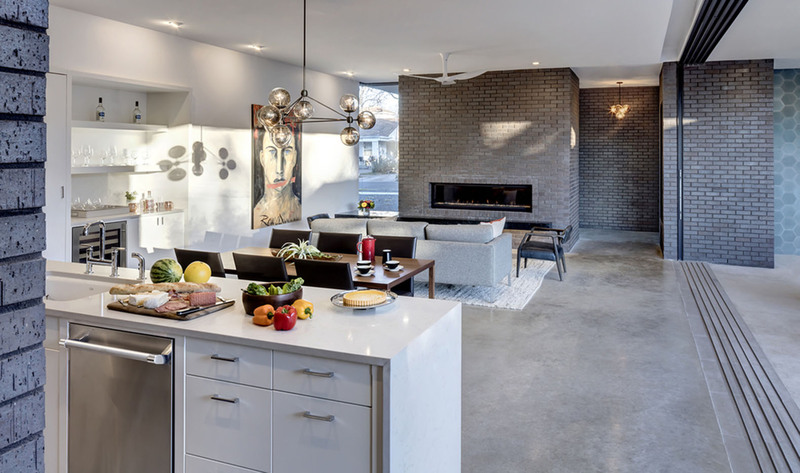 To achieve this, they focused on the home’s site orientation, thermal bridge-free connections and airtightness. All of the openings were placed to welcome in plenty of light without bringing in the hot western sun. The pool was situated so that breezes could flow over the water and carry the cool relief indoors. Trees provide dappled light, and a large roof overhang keeps direct sunlight out of the home. The result is plenty of light without the heat. The house was designed with minimal amount of surfaces and openings and a sheltered entry and staircase clad in iron spot masonry. This entry volume demarcates the line between public, common and private spaces, which gives in inhabitants plenty of privacy, but also provides for ample entertaining space. The living room freely opens into the yard, and is devoid of visual and spatial obstacles. This is achieved by placing the service core along the east facade. The open-plan layout allows natural light to fill the interior and reduce reliance on artificial lighting. Cross ventilation is enable by double-glazed operable windows and low-E coating. Advanced insulation helps keep the house cool in the summer. Despite its sleek, energy-efficient design features, the house was relatively cheap to construct-only $250 per square foot. The house was designed with minimal amount of surfaces and openings and a sheltered entry and staircase clad in iron spot masonry. This entry volume demarcates the line between public, common and private spaces. The living room freely opens into the yard, and is devoid of visual and spatial obstacles. This is achieved by placing the service core along the east facade. The open-plan layout allow natural light to fill the interior and reduce reliance on artificial lighting. Cross ventilation is enable by double-glazed operable windows and low-E coating. Advanced insulation helps keep the house cool in the summer. Despite its sleek, energy-efficient design features, the house was relatively cheap to construct-only $250 per square foot.